About Richard M. Foxx, M.D. Home » Richard M. Foxx, M.D. After graduating from Brandeis University in 1958, Dr. Foxx attended Hahnemann University School of Medicine in Philadelphia, graduating in 1962. He completed an Internal Medicine internship, and followed that with a residency in Obstetrics and Gynecology. He achieved board certification in 1968. Dr. Foxx volunteered for the U.S. Army and served as Regimental Surgeon for the 6th Armored Cavalry. Following his honorable discharge in 1968, Dr. Foxx relocated to Southern California. Joining the staff at Hoag Memorial Hospital in Newport Beach, he was made chairman of the Utilization Review Committee and then chairman of the Department of Obstetrics and Gynecology. 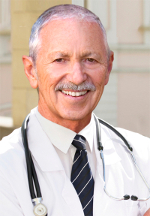 He opened an office at WellMax in La Quinta, California, in 2000 where he practiced gynecology and wellness medicine. A frequent lecturer at Gilda’s Club Desert Cities, Dr. Foxx also volunteered at Martha’s Village, a facility serving the indigent. Dr. Foxx was invited to open a medical spa at Hyatt Grand Champions Resort in Indian Wells in 2002, and in 2003 opened The Medical and Skin Spa. As one of the original medical spas, Dr. Foxx’s medical spa was featured in publications from The Wall Street Journal to The Los Angeles Times. The Medical and Skin Spa received national and international recognition and received numerous awards. It was featured in 100 Best Spas of the World in 2006 and honored as one of the eight great medical spas in the world in 2011. He has made countless television appearances and has lectured on the topic in New York, Atlanta, Los Angeles, Phoenix, and Las Vegas. A published writer on medical and lay topics, he is a published author (Spirit Ranch) and at work on his latest book, When You Look in The Mirror, What Do You See? With a lifelong passion for horses, Dr. Foxx has been involved in their training for decades and has used them in the treatment of abused women as well as in the evaluation of Post Traumatic Stress. Dr. Foxx lives on a small ranch outside of Escondido with his wife JoAnn, Sammy, his dear black Lab, and his horses.